Growing up, I was lucky to have my mother make me breakfast every morning. Before I became accustomed to coffee, my mother would heavily encourage me to drink the orange juice she poured, as it would ‘wake me up’ and it’d be a way to get more fruit into my day. I can see why my mother pushed me to drink the orange juice instead of handing me an orange, as there may be misperceptions about ‘orange’ juice being just as healthy. The USDA allows fruit juice companies to make statements such as ‘one serving is equal to one serving of fruit’, yet after further research, I can attest they’re not equal. Now, the general advice is to opt for fruit, instead of the juice form, which is stripped of fiber, but added sugar has been included. While fresh fruit and freshly squeezed orange juice contain approximately the same levels of carotenoids and vitamin C, the levels of flavonoids are lower and pasteurized orange juice contains more antioxidants. In particular, the flavonoid, hesperidin, is concentrated in pulp and shows promise as an anti-inflammatory by lowering blood pressure and promoting healthy cholesterol. In addition, studies have found nutrients in some fruits and vegetables are more bioavailable when chopped, mashed, juiced or prepared with oils. However, I’m not promoting the switch to juices just yet. Unless you’re making your own juice, the typical jug or bottle of juice purchased at the grocery store spikes blood sugar levels more and at a quicker rate than eating whole fruit. A study from Harvard found a link between regular juice consumption and increased risk of type 2 diabetes, meaning the downsides of juice unfortunately far outweigh any potential boosts from carotenoids. Furthermore, store bought fruit juice tends to have a bit less concentrated fructose than soda, with fructose surmised to be a riskier form of sugar than glucose due to the increased risk of chronic diseases (e.g. liver and cardiovascular disease). Deemed as ‘liquid sugar’, orange juice will leave the stomach much more quickly than whole oranges, due to the stripped fiber. 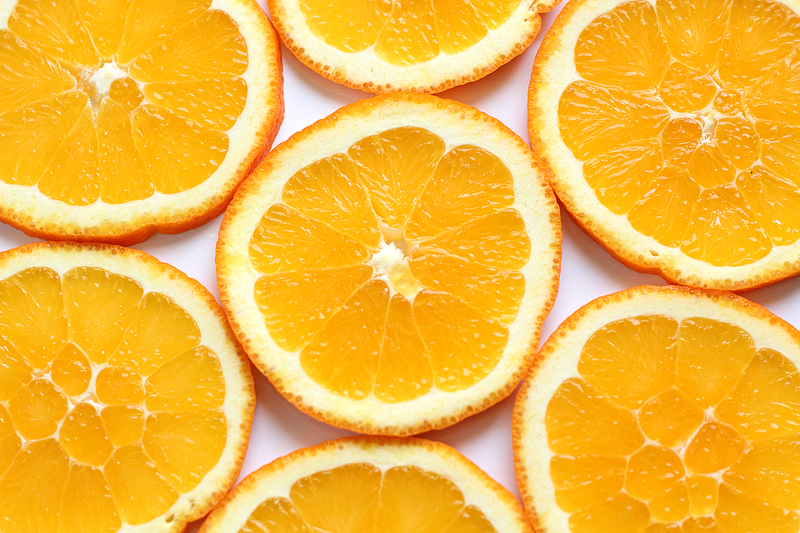 Nutrient Breakdown: An 8 oz glass of orange juice has approximately the same amount of energy as 2 oranges. As you can see, there’s more fiber and calcium in an orange fruit and the orange fruit contains natural sugar versus the added sugar that is put into orange juice. I’m not sure why, but the calories one drinks doesn’t register as part of daily caloric intake. We have the tendency to gulp juice down in seconds, yet the healthier contrast of eating an orange requires more time, ‘feeding’ multiple senses while peeling. Now that I’ve seen it for myself, next time I head to the grocery store, I’m stocking up on oranges! Note: If you do opt for OJ, choose with pulp, then at least you’ll be getting some more fiber in!